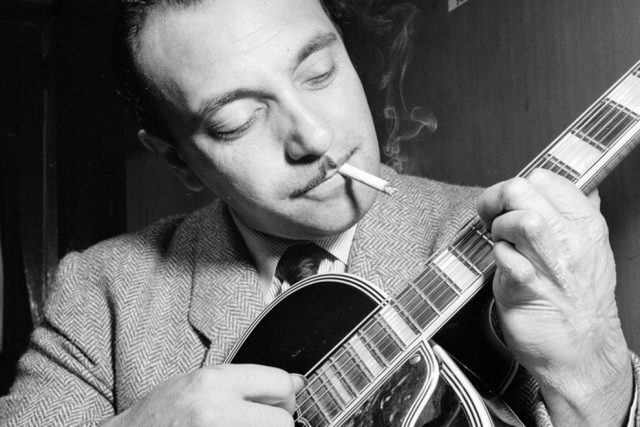 In 1928 French guitarist Django Reinhardt suffered severe burns during a fire, resulting in the loss of function in two of his left fingers. Consequently, he devised new techniques and idiosyncrasies that allowed him to continue playing. A confluence of factors, the foremost being his own commitment and talent, led to Reinhardt’s continuation as a musical performer. But Reinhardt’s preference for jazz over classical music also played a role in his success. As classical guitarists require extensive use of the ring finger, Reinhardt would have faced greater obstacles had he not been a jazz artist. The existing classical repertoire did no favors for Reinhardt. According to jazz scholar Benjamin Givan, Reinhardt’s impairment prevented him “playing chords which require considerable wrist supination” and “precludes many fingerings which are merely run-of-the-mill for non-disabled guitarists.” Classical music and its strict adherence to prescribed fingerings, chord voicing, and other technical aspects would have been unfeasible. Jazz, however, was far more accommodating of Reinhardt’s impairment both in terms of technique and repertoire. Limited in playing close intervals, Reinhardt would instead employ alternate chord voicings that could result in unique sonorities. Rapid runs up the guitar neck, often associated with Reinhardt, were likely resultant from his difficulty with shifting strings. These idiosyncrasies, among others, borne from Reinhardt’s disability help form his distinctive style. Reinhardt’s success in jazz exposes the extent to which disability in music is constructed. Instead of framing his success as solely an individual feat we should hone in on the factors that necessitated Reinhardt’s invention and how they may influence or limit other disabled persons. Featured Above: Two versions of the same song, “A Little Love, A Little Kiss.” The first performed by Reinhardt, the second by Eddie Lang. Note the two different uses of chords — Reinhardt’s consists of two notes, spanning large intervals, while Lang uses many notes and close intervals. Ellis Coan is a senior at Davidson College. October is National Disability Employment Awareness Month in the U.S., established more than 70 years ago to celebrate the contributions of workers with disabilities. WDAV partnered with Davidson College students in Professor Neil Lerner’s seminar on music and disability studies to produce a blog series highlighting composers and performers with disabilities. This post is a part of that series. Be sure to check WDAV: Of Note for additional blog posts focusing on different artist.